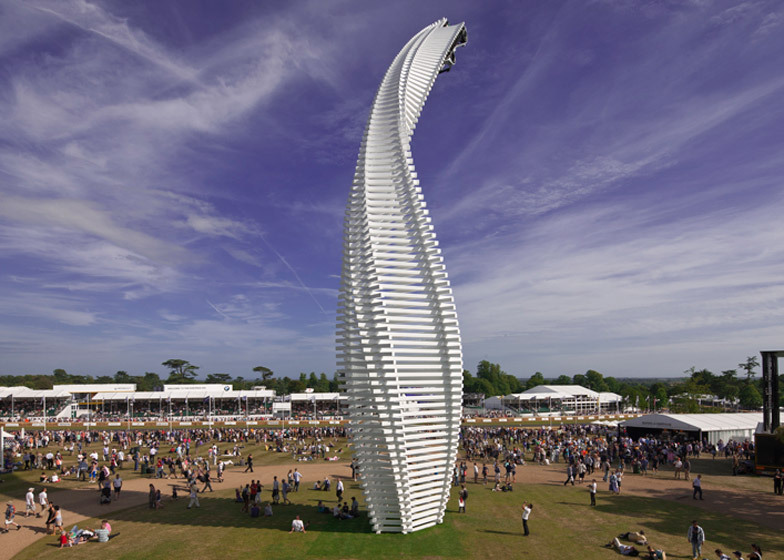 This year's installation at the UK's Goodwood car festival was based on a blade by Modernist designer Enzo Mari. 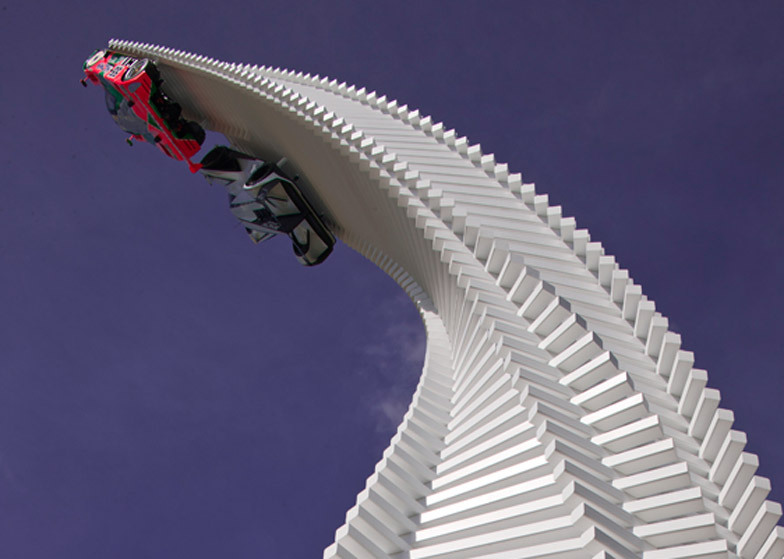 The 40-metre-high Kodo sculpture was created for the Goodwood Festival of Speed, which took place in West Sussex from 25 to 28 June. 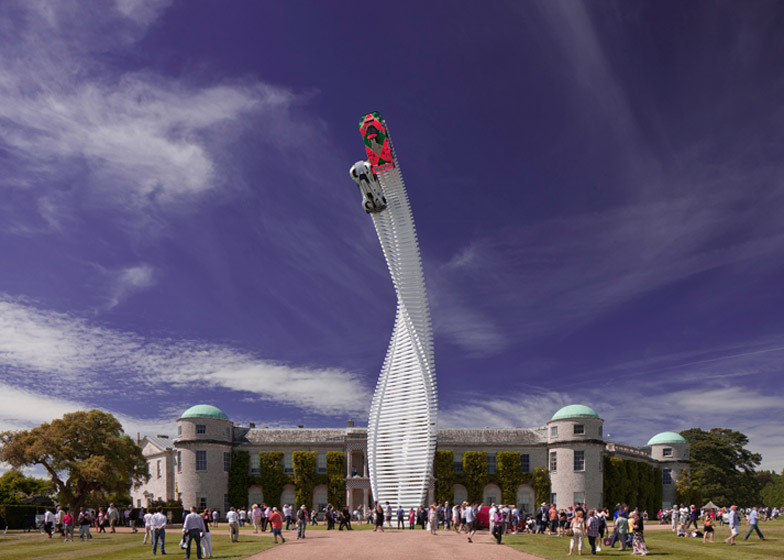 Its designer, sculptor Gerry Judah, has made installations for the event in the grounds of the Goodwood House stately home for 18 years running – each time for a different car brand. 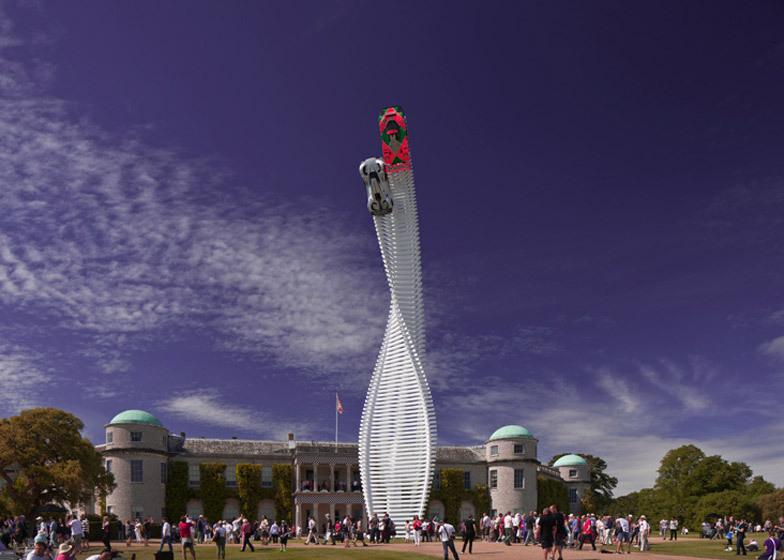 Previous designs have included a white knotted sculpture of a race track, a 28 metre-high steel version of the Jaguar E-Type and a bright red looping structure. "Every year I like to think of something that is very different to anything we've done before," said Judah. 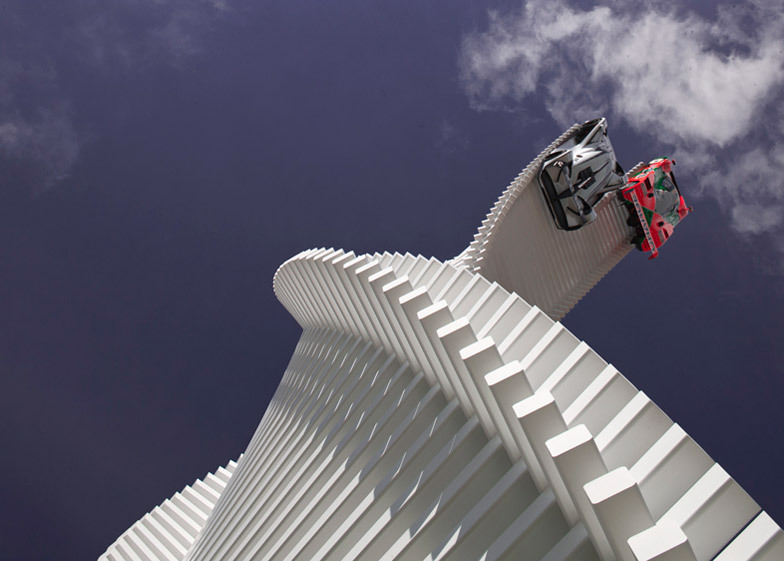 "Indeed, the hardest thing about designing these sculptures is trying to avoid any similarity, any conceptual connection, with anything I've done before." 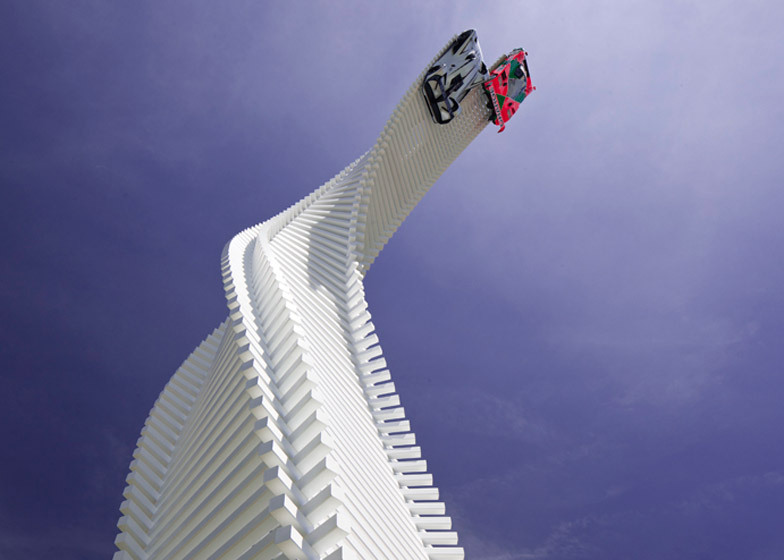 This year's sculpture was dedicated to Japanese brand Mazda in celebration of its MX-5 model's 25th anniversary. The company's head of design, Ikuo Maeda, came up with the idea to base the shape of the structure on the Ameland paper knife, a letter opener designed by Enzo Mari for Italian brand Danese Milano in 1962. Mari, an influential Italian artist and designer, produced Modernist furniture and homeware throughout the second half of the 20th century and has won the Italy's prestigious Compasso d'Oro design award four times. A self-assembly chair he designed in 1974 was put into production by Finnish brand Artek in 2010. 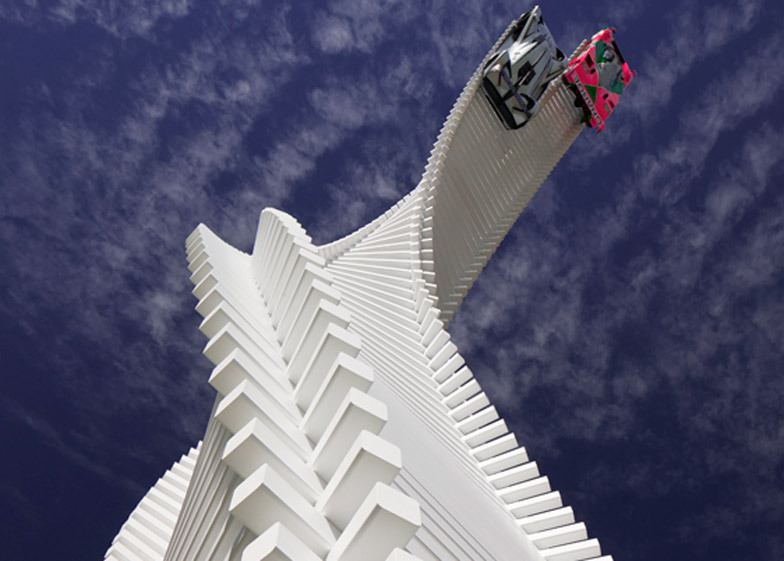 Judah and Mazda's european design director Kevin Rice worked together to turn Maeda's idea into a sculpture that followed the car company's Kodo design philosophy – described by Rice as "breathing life and motion into an object". 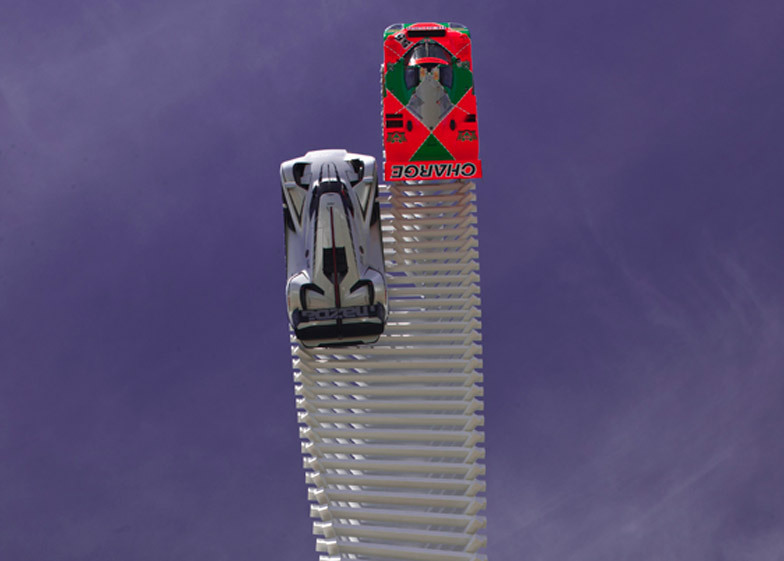 "I started to play with hundreds of ideas based on our discussions to do with twisted metal forms, trying out version after version until I came up with just a very simple twist inspired by the Kodo philosophy," said Judah. 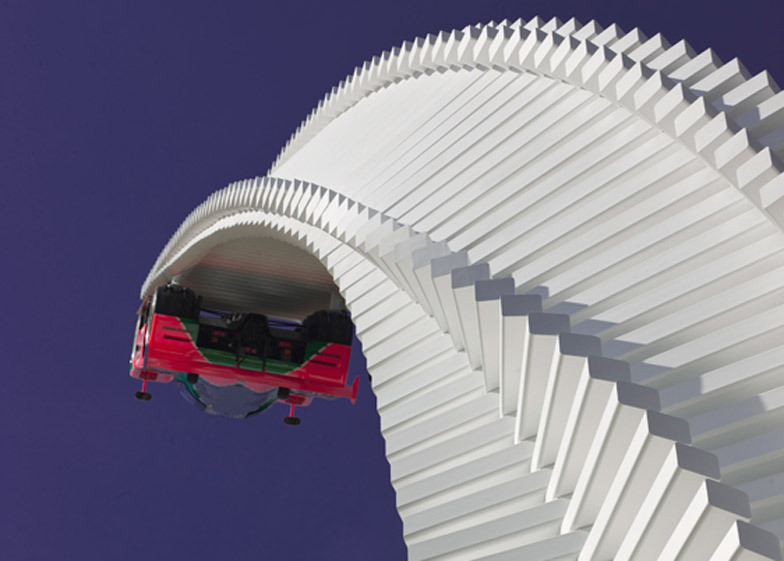 The sculpture was also designed to reflect the Japanese word "shinari", which refers to the pent-up power in tensile objects created through twisting or bending, and is also name for a concept car released by Mazda in 2010. 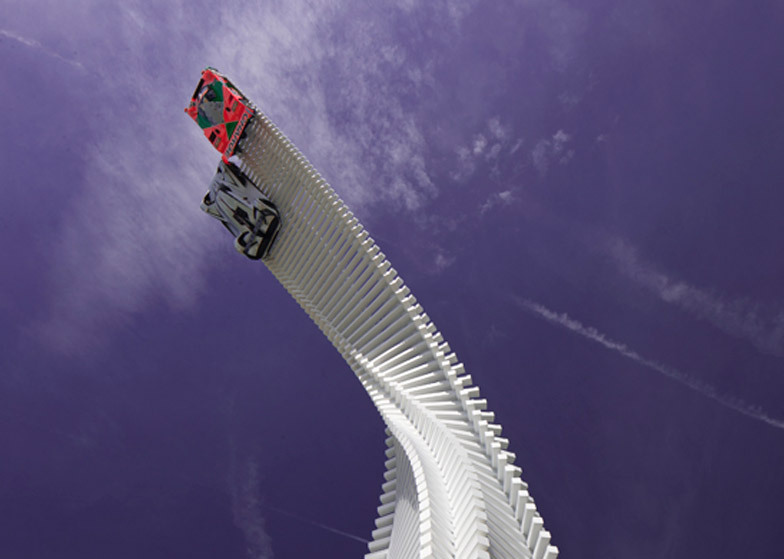 The resulting shape proved too complicated to build with sheet steel, which the sculptor has used for his previous installations for the site. 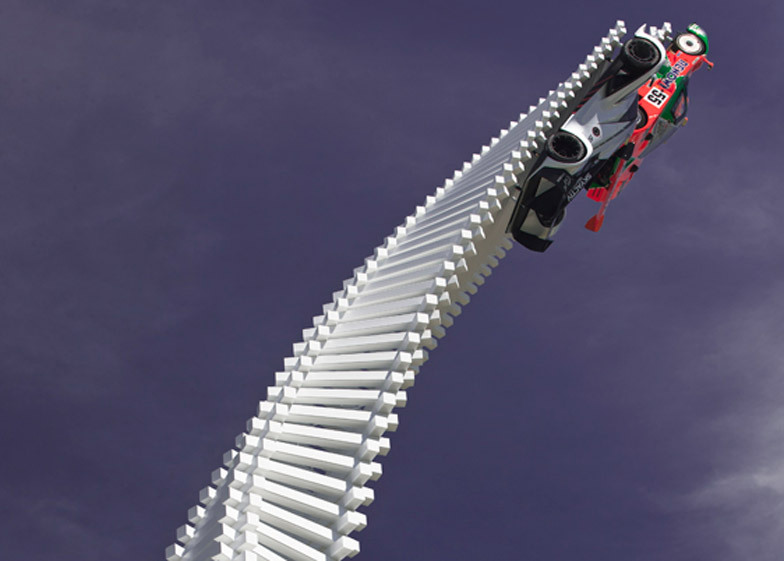 "The Mercedes, Lotus and Porsche sculptures were monocoques in which the skin itself was the structure: flat sheets of steel welded together to create a shape," Judah said. 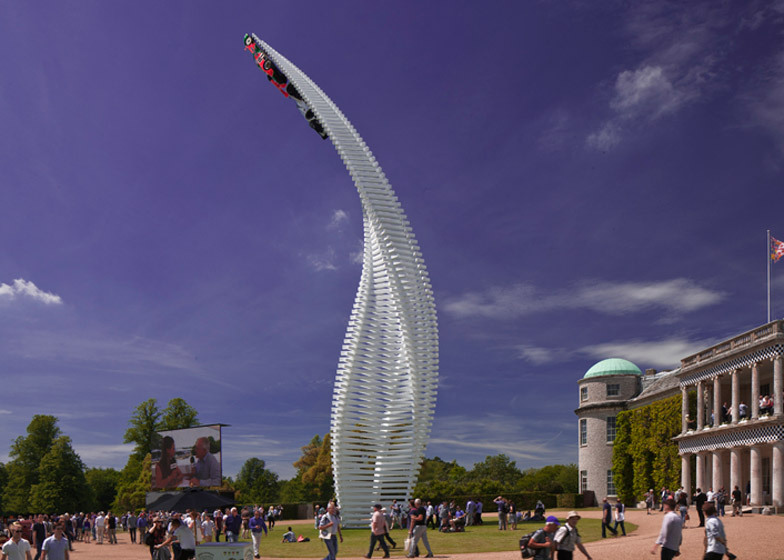 "But to do this piece in the same way, we'd have to twist each individual steel plate, which would be impossibly complex, time consuming and expensive." 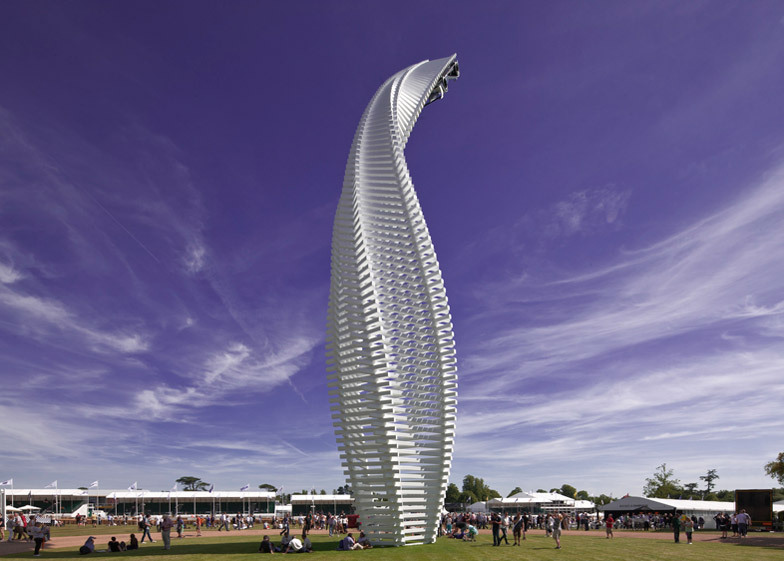 Instead, the twisting form was made from a series of stacked overlapping bars, which are incrementally rotated to create the warped shape of the tower. "I had the idea of making the whole structure out of strips of wood," said Judah. "Sadly, using timber would have been phenomenally expensive and hugely heavy." 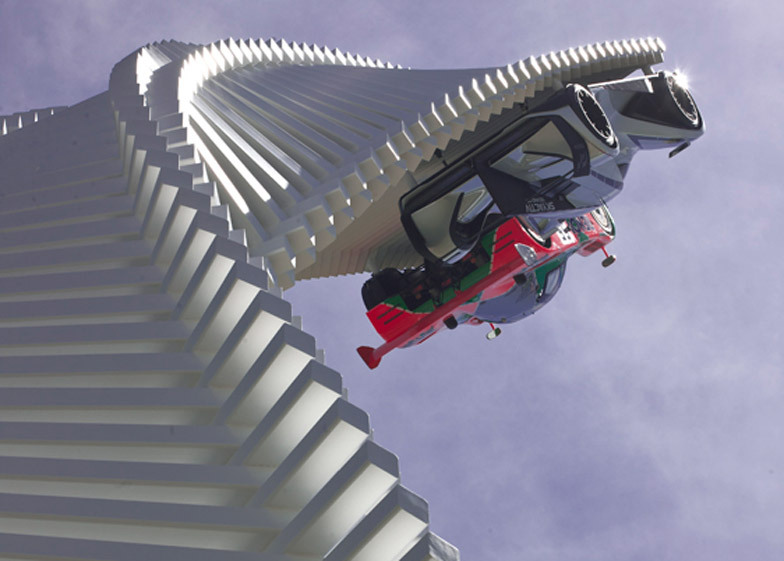 Originally designed to display three vehicles, the finished structure supported two Mazda race cars mounted vertically at the top: the 787B that raced in the early 1990s alongside the LM55 concept unveiled late 2014. 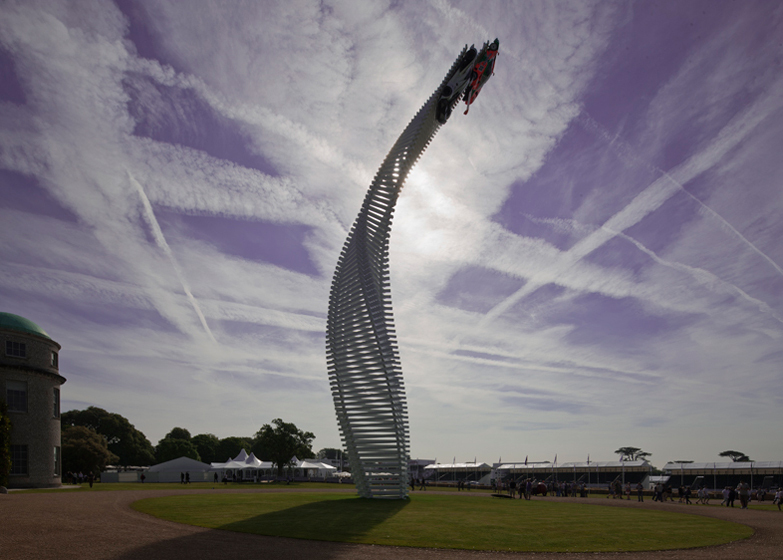 Judah worked with engineer Bruno Postle from Capita and Littlehampton Welding fabricators to complete the project, which remained in place for the duration of the four-day event. Photography is by David Barbour.